A new study by the Better Government Association finds that Gov. Bruce Rauner is lying in his attacks on a proposed progressive income tax for Illinois. Illinois is one of only eight states with a flat tax rate, having hiked the rate for all income to 4.95 percent last year in the budget the General Assembly approved over Rauner’s veto. The Institute on Taxation and Economic Policy ranked Illinois as the fifth-most-regressive state for taxation. Rauner, however, likes to point to Indiana, where the flat tax rate is 3.23 percent, and Michigan, where it’s 4.25 percent, as states to be emulated, even though it’s worth noting that Massachusetts has a 5.1 percent tax rate and North Carolina 5.5 percent, and they aren’t exactly hurting economically. In fact, an earlier BGA study found no evidence behind claims that higher taxes are driving people out of Illinois. After the General Assembly first hiked the tax rate to 5 percent in 2011 under Gov. Pat Quinn, population increased 20,000 over the next four years. After legislators dropped it in 2015 in extending an olive branch to the newly elected Rauner, state population dropped 60,000 over the next three years. But to return to Rauner’s claim that middle-class taxpayers would pay more in a progressive tax system, 32 states have some sort of graduated income-tax system. Iowa has nine tax brackets peaking at 8.98 percent, while Minnesota has four peaking at 9.85 percent. A Rauner spokesman later clarified that six states would offer lower taxes for a family with household income of $59,000, considered the U.S. median. The BGA countered that the median personal income is actually $35,700, and by that measure 11 states would offer that person lower taxes than Illinois. According to state Rep. Tony McCombie, of Savanna, a recent study of taxes in the Quad Cities found that, for a family of four with the head of the household making $150,000 and with a $250,000 home, residents would actually pay the most taxes annually in Davenport, Iowa, at $18,428. Those in Moline would pay the least at $16,592. Only East Moline would pay more than even Bettendorf, Iowa, because while property taxes are higher in Illinois, Iowa more than makes up for it with its graduated income tax. McCombie’s point was that Iowa schools were outperforming their Illinois counterparts in the Quad Cities, in part because of that state investment, in which education spending is not as tied to property taxes as it is in Illinois. Rauner’s Democratic opponent, J.B. Pritzker, who has been the target of Rauner’s claims on progressive income taxes, has declined to specify a system of tax rates and brackets, saying it’s something that would have to be worked out with the General Assembly once the state constitution was altered to permit a progressive tax. But Manzo, working from a proposal from the Center for Tax and Budget Accountability, said the state could cut the tax rate to 4.5 percent for anyone making less than $100,000, keep it level at 4.95 percent for those making $100,000 to $300,000, and create three brackets ranging from 8 to 9.85 percent for those making more than that. 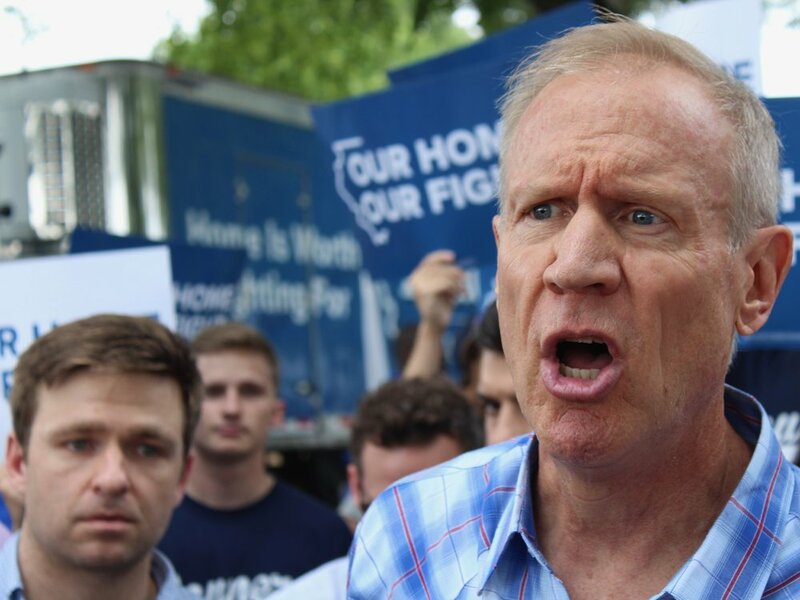 The BGA, of course, has already determined that Rauner’s arguments against a progressive tax are similarly unsound — and based on outright lies.